With the U.S. increasingly engaged elsewhere, should Japan do more for regional security itself? The U.S. pivot (or rebalance) towards Asia is America’s “I’m back” moment and a warning to China (to paraphrase The Terminator’s “I’ll be back” message). For Japanese who fear Chinese expansionism it is a welcome development. But there is now a risk of a counter-pivot. A full-scale war with Russia is unlikely. But the invasion of Ukraine, combined with European disunity, vacillation, and weakness, ensures that Washington will focus more on NATO’s eastern borders in the coming months and probably years. Meanwhile, the Islamic State, also known as ISIS or ISIL, the implosion of Yemen, anarchy in Libya, the depredations of Boko Haram, disorder in Mali, the resilience of Al-Qaeda franchises, and other developments are sucking the United States back into the gigantic quagmire that ranges from the Atlantic coast of West Africa to Pakistan. Greater American military involvement, beyond a few targeted strikes and special operations missions, may serve no useful purpose. But Western societies, especially America’s, find it hard to accept that some problems are beyond their ability to solve. The United States could easily drag itself into a Global War on Terror 2.0. At this point, predicting the extent of future U.S. deployments in the CENTCOM and AFRICOM areas of responsibility seems a fools errand. It could remain fairly small if Americans have the discipline to differentiate what is possible (not much) from desirable outcomes. But fears for the safety of the Persian Gulf oil fields, concerns about attacks at home, and moral outrage against Islamists could bring about a far larger long-term American engagement. This would be bad news for Japan. The pivot could be partially reversed. China would more easily challenge the U.S.-Japan order in Asia. Asian nations, both enemies and allies, would doubt American credibility. Can Tokyo alleviate the impact of the “counter-pivot”? It cannot stop it, but there are things that it could do that might limit the damage. Supporting the United States in Ukraine is one of them. Russia is, to some extent, vulnerable to economic pressure if it is severe enough. The more Japan backs the U.S. on sanctions, the greater the cost to Russia. Even if it doesn’t stop Putin, these measures will weaken his country. Participation in various schemes to boost Ukraine and neighboring states could also help. If this brings about a successful resolution to the Russo-Ukrainian war, it would facilitate a U.S. “return” to Asia. There is little that Japan can achieve with respect to the Islamic State and assorted Islamist groups besides providing money to local U.S. allies who are unlikely to use it effectively. We cannot expect Japanese troops to parachute into Mosul nor will the Ground Self-Defense Forces (GSDF) deploy divisions to crush Boko Haram. Economic sanctions are of little use against these polities. So we are left with the conclusion that the only solution for Japan is to compensate for the possible drawdown of U.S. resources by providing more regional security itself. This would entail a stronger SDF, more economic and military assistance to the informal anti-China network (such as Vietnam, Philippines, and India), and a greater effort to improve ties with Seoul (to be fair, South Korea also has to act as responsibility for the frayed relationship is shared). The first step on this long march is realizing that the widely held belief that Japan cannot spend more to defend itself is the product of minds who know little about economics, let alone national security. Using the broadest definition of military outlays, Japan earmarks 1.5 percent of its national income to the armed services and paramilitary organizations. If it were to double that, 97 percent of its economy would continue to be dedicated to civilian pursuits, hardly an unprecedented figure. 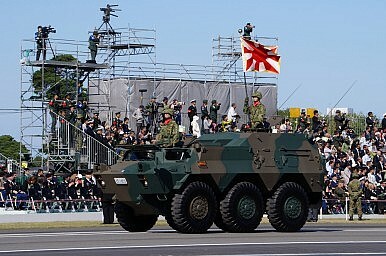 If one believes that the total Japanese budget should not increase, cuts in other departments would fund additional military spending without wrecking the other ministries (part of the increase would at any rate go to other agencies for development assistance, intelligence, diplomacy, R&D, cyber, space, coast guard, etc.). Alternatively, greater investment in national security could be part of a Keynesian stimulus. In many ways, it would be the perfect “second arrow” for Prime Minister Shinzo Abe’s three arrows strategy for the economy (the first being quantitative easing by the Bank of Japan, the third one structural reforms). Defense provides jobs and generates demand for goods and services that are mostly procured at home. It boosts R&D capabilities, provides great training to young men and women, and is thus a better use of public resources than bridges to nowhere and other pork-barrel projects. The Abe cabinet could also pray that after a brief interlude, the U.S. will revert back to the pivot and/or massively increase Pentagon funding. It could hope that, as is probable, the China threat is overstated. Japan would therefore continue to relegate defense to an afterthought when setting national policy. This is a perfectly reasonable course of action, but it will be a costly one if it turns out to be wrong. Why the United States should close the credibility gap in a tense region.